As the sole product designer on the team, I was responsible for leading the entire UX research and design process. This started with a thorough analysis of the existing experience, followed by user interviews, persona development, lots and lots of sketching, creating low-fidelity and high-fidelity mocks, translating designs into clickable prototypes, conducting user tests to gather design feedback, and quickly iterating until we landed on something we felt confident building and releasing. From there, we measured results, iterated, and continued to improve the experience for our customers. Inspirato is a private travel club that provides member access to a curated collection of luxury villas, top of the line hotels, and once in a lifetime experiences around the world. Nobody was using the app because of how complicated it was to use. I came on board a few months after the app was released. The initial version of the app was extremely complicated and difficult to use. As a result, people downloaded the app, were unable to use it, and abandoned it completely. Create a useful and usable experience that allows Inspirato members to take the club with them on the go. 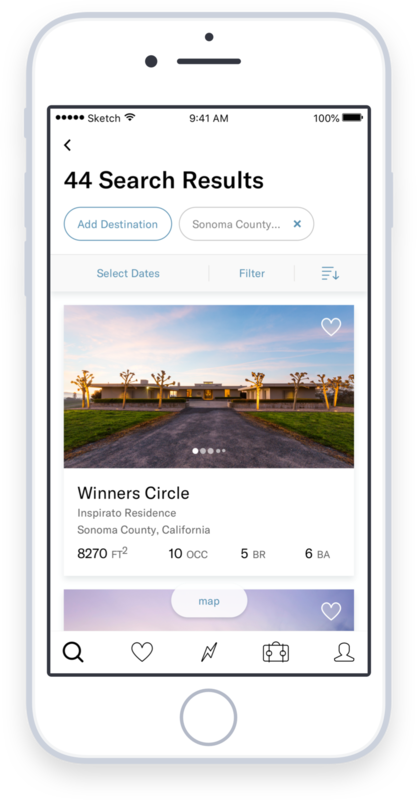 From browsing and booking Inspirato vacations to trip planning and logistics, the app should help ease the headaches of travel and allow people to have a relaxed, enjoyable travel experience. The Inspirato iOS app allows members to take the club with them on the go. 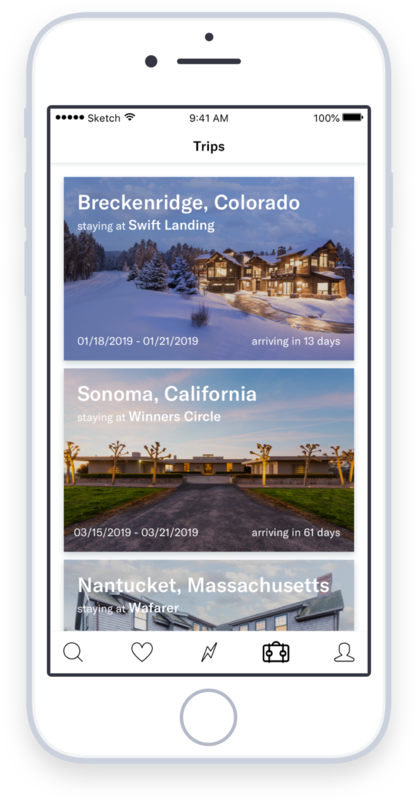 From daydreaming about where to travel next to ordering groceries for an upcoming trip, the Inspirato app allows members to make the most out of their membership. The app is and will always be a work in progress. With every release we are measuring results and continuing to iterate and improve existing features as well as add new ones to deliver the best experience to our users. The original version of the app put destinations at the core of the experience. However, we discovered that people really wanted to see our homes. Now, instead of opening the app and seeing generic pictures of a beach in Mexico or a mountain in Colorado, people see what they joined Inspirato for—the impressive collection of luxury vacation homes. Being a private travel club with highly curated homes, there are not accommodations in every destination. As a result, members searching for common destinations like 'Cancun, Mexico’ showed no results. By allowing people to search for destinations outside of our collection and showing nearby options, we were able to help members discover accommodations that they otherwise would not have known about. Another area of opportunity we identified during our research was around our weekly specials program called Jaunt. Each week, dozens of trips are deeply discounted and added to our Jaunt program. And, members are eager to get their hands on these deals. We created a centralized place for members to quickly search through each week’s deals so they can easily find the trip they’re looking for. We added weekly push notifications to alert members the moment deals went live. Getting the best Jaunts is like getting tickets to a popular concert — you have to be ready the moment they go live. Additionally, we created the ability to have a personalized message if any of the members favorites were listed on this week’s specials — taking them directly to the deals they were most interested in. The new Trips section allows members to manage and plan as their trip approaches. Members are easily able to add travel details such as flights, details about the people accompanying them on the trip, stay up to date with the trip itinerary, and seamlessly order groceries so the fridge is stocked upon arrival. After the trip is over, they are able to view folio charges, add gratuities, and make payments. The Trip Timeline helps members keep track of all the different pieces involved in planning their trip. 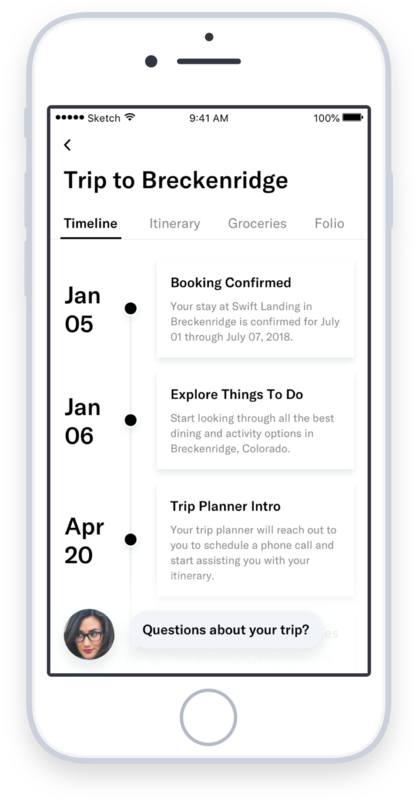 From directing them to browse things to do, to grocery order reminders, and finally introductions to their local concierge a few days before check in, the trip timeline keeps members engaged with Inspirato and dreaming of their trip for months leading up to their vacation. The Local Meals feature allows members to find fun, local recipes to make while on their trip. It also takes the headache out of meal planning and grocery ordering — simply select the meal you plan to cook, enter the number of servings, and we make sure you have all the ingredients you need. 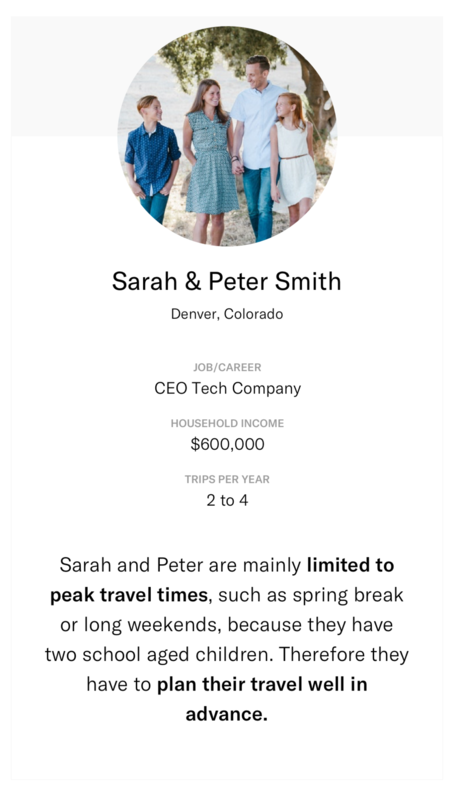 The initial app experience was built around the concept of “natural language search” — forcing people to open the app and select if they wanted to “vacation,” “daydream",” or “jaunt” in which destination and when. This required people to make a lot of upfront decisions before engaging with Inspirato’s offering. 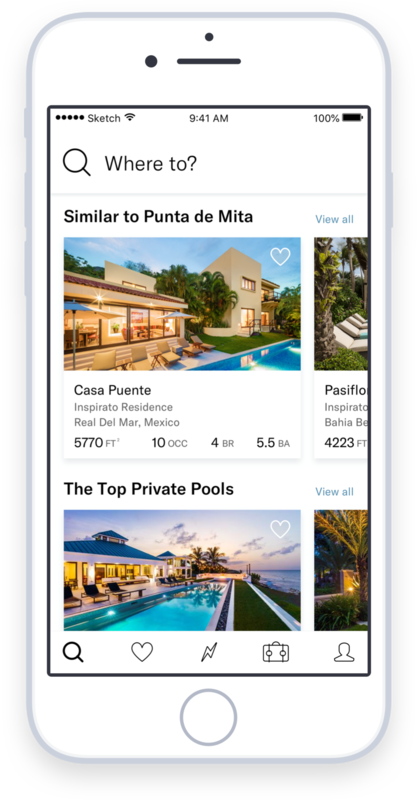 Everyone wanted to use the app to browse through the many luxurious homes and hotels Inspirato offers — one person even described the desire to open the app simply to “drool" over homes. Every Wednesday at 1pm, Inspirato releases weekly discounted trips through a program called Jaunt. This program is extremely time sensitive and the fastest person gets the best deals. Members wanted a centralized place to quickly browse and search the weekly deals so they could easily find deals that interested them. It was no surprise that people wanted to use the app to see upcoming trips. Members talked about being out to dinner with friends and wanting a way to quickly show them where they were traveling — however the existing experience didn’t allow them to see what home they had booked. Both app usage and bookings have continued to increase—with bookings going from less than $30,000 per month to over $1 million per month.